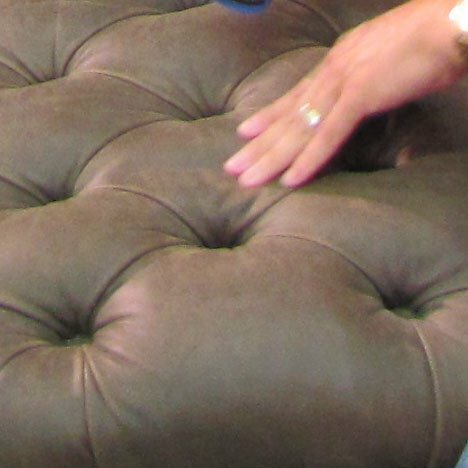 My customers are confused about different types of leather – either because they aren’t sure what they should look for when it comes time to buy new furniture, or because they have a problem (like a scratch or stain) that needs to be fixed. This quick guide should help you understand the big picture. If you have other questions, leave them in the comments below! 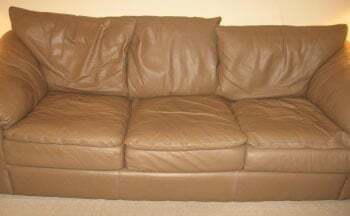 Fully-finished leather, seen frequently in furniture brands like Lazy Boy, Palliser, Natuzzi and Elite as well as in automotive interiors, has a durable surface finish that resists scratches and staining. Fully-finished leathers make up approximately 85% of leather used for furniture and 99% of leather used in the automotive industry today. If you have kids, pets or messy guests, Fully-finished leather is the way to go. If you have a spill on fully-finished leather, just clean it up quickly with a damp rag and wipe dry with a dry towel – simple as that. Semi-ani line leather is often made from a hide with fewer blemishes than fully-finished leather. These leathers are transparently dyed and have a thin surface coating that makes them more durable than aniline leather (see information below), but less durable than fully-finished leather. Semi-aniline leather has a soft surface that feels like it has a film on it – this is the thin surface coating. These leathers can be cleaned, and most stains and scratches are relatively easy to solve professionally. the leather to show through, but anilines don’t have a surface coating. The downside to these beautiful aniline leathers is that they stain and scratch very easily and are generally more difficult to repair. You’ll know you’re looking at aniline leather because is the most natural feeling of all leathers and is soft to the touch. You’ll hear the words, “Nubuck,” “pure aniline,” “wax and oil pull-ups” and “raw leathers” all referencing leather that has no surface finish. That is what we refer to as aniline. This leather is rare (less than 15 percent of the leather market) and is often expensive.